Have you always wished you could see into the brain of a person who is Focusing? Have you wished that someone would apply modern brain scanning technology to have a look at a person’s brain before, during, and after Focusing? Alex Maunder and Lucie Therrien have done just that, with a person doing WholeBody Focusing. What a great thing to do! 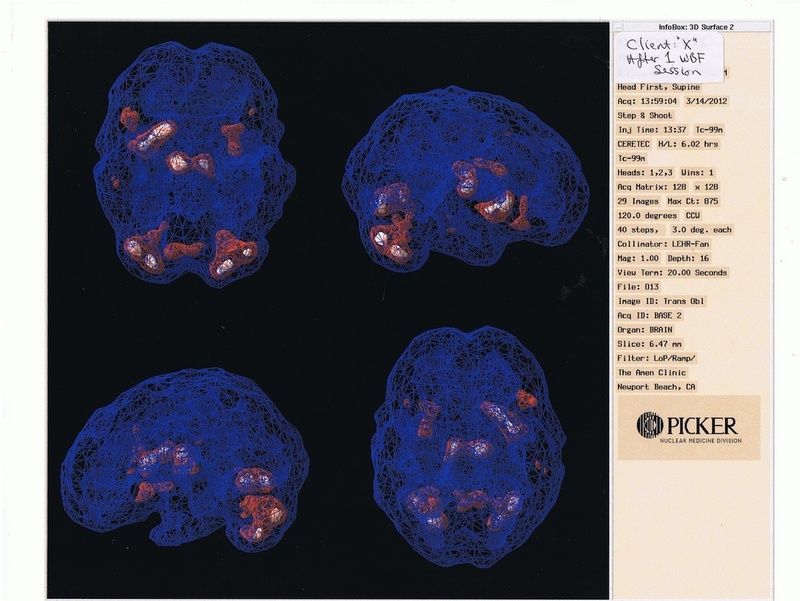 We’re publishing a shorter, less technical version of their article, and you can see the full study with the full-color brain scan images on their website: www.wholebodyfocusing.org. What I find especially interesting is their discussion of the ideas from Kevin McEvenue and Karen Whalen about holding two different objects of attention at the same time. WholeBody Focusing is an empowering method for allowing the whole body to bring presence and healing to hurts and stoppages in body and emotional process. In WholeBody Focusing, the Focuser typically stands rather than sits, and allows spontaneous movement to emerge from inner felt awareness. WholeBody Focusing was developed by Kevin McEvenue and blends elements of the Alexander Technique with Focusing, with Kevin's unique genius. Today WholeBody Focusing (WBF) is taught all over the world. Having felt the profound shifts that take place in consciousness during Wholebody Focusing (WBF) sessions, we (the authors) really wanted to try and research this and capture this magic in images of some sort and to understand the fundamental principles at work. Long term, we also wanted to see if permanent changes in personality and functioning can result from Wholebody Focusing sessions and to prove this in a scientific way. There are very subtle differences in methodology and procedure between Focusing and WBF, although in essence they are both working with the felt sense as a method of self-enquiry. In WBF we start by inviting the body to function as a whole, and we emphasize the concept of the body as a container using “the power of awareness to awaken the inner wisdom of the living body” (McEvenue & Whalen, Advanced WBF Manual). It is only when I feel grounded and connected to something bigger than myself that I can know who I really am. In a sense WBF is making explicit what is always implicit in the Focusing process: by observing the place that does not feel right within myself, I am also implying that there must be another part of myself that does feel right and it is the interconnection and support generated by these two parts that allows the transformation and shift to take place in the whole intelligent, living organism. Another subtle difference when working with WBF and the sense of the whole body as a container is that I can often connect with a part of me that feels profoundly joyous – no matter what my outer situation might be – fairly early on in the session. Call it a sense of lightness, of joy, of “Beingness” – this is experienced in the whole of the organism and it is much bigger than, and can contain, the part of me that does not feel right. In regular Focusing this wonderful sense of release and happiness is most often experienced after the felt shift has taken place. One of the things that has often struck me (Alex) are the actual physical changes in the posture, alignment and structure of the body that take place during the course of a Wholebody Focusing (WBF) session. These are linked to changes in energy levels, as the Focuser comes into a deeper contact with the Self. The Focuser’s face can lighten up, a serene glow can come into the eyes, as there is a shift to a more integrated and relaxed state of being. There are also changes in the tone of voice, subtle changes of resonance, and shifts of intonation. Often the Wholebody Focuser will articulate a sense of being supported by the whole of Life rather than being alone and isolated in the world. There is a deepening of contact as both Focuser and listener become more grounded in Self. At times it seems as though you can catch a thought just the instant before the other person has articulated it. I wondered if maybe a skilled and tuned-in photographer would be able to capture these subtle shifts and nuances that take place during the course of a session. With the right perspective and lighting, maybe it would be possible to capture that expression in the eyes, the relaxation of the facial muscles, the subtle postural re-balancing that takes place in letting go and being supported by the Earth at the same time. We could have a collection of images that all hint at the profound and subtle changes that are taking place. But the problem is that we are not such skilled photographers, and even if we were those images would only mean something to an outside viewer if they had an inner attunement to the process that was taking place. It’s just as you can only fully appreciate and savor the music that is being performed out there, when you have the resonance of the inner music that is taking place inside yourself. Or you can only fully appreciate a painting of a landscape after you have sat yourself down on top of a hill and looked at the glory of another landscape unfolding in front of your eyes and felt something come alive inside of yourself. So when we were seeking to produce images of the WBF process that would be generally understandable to a wider public in an objective way, we had to think of something new, something different, that could try and capture the images of the WBF process and also explain in an objective way what is actually going on inside the brain of a Focuser during the course of a WBF session. With the advent of modern high-tech brain imaging technology, like MRI scans and SPEC scans, it is now possible to look at exactly what is happening inside the brain of a Focuser and the changes that are induced there during the course of a session. What sorts of connection are being made? What parts of the brain are being stimulated? What sorts of brain wave patterns are being induced? For the first time, these precise images of what is happening inside the brain of the Focuser during a Focusing session are available for view by professionals and the general public alike. Because we are trying to be scientific, we also need to be testing an underlying hypothesis. What is the crucial part of the whole Focusing process? What induces this transformation of consciousness? For us the crucial part of Focusing is the experience of the “felt shift” and what induces it is the neutral observing consciousness that is able to step back into the position of the detached observer. So when we were seeking to produce images of the WBF process that would be generally understandable to a wider public in an objective way, we had to think of something new, something different, that could try and capture the images of the WBF process and also explain in an objective way what is actually going on inside the brain of a Focuser during the course of a WBF session. All of these patterns of neural firing were measured on a qEEG scanner, and the five sets of results were recorded, which showed both the type of brain wave activity and the areas of the brain that were activated. Be at rest, just allowing thoughts to come and go in a random manner. Direct awareness to two different parts of the body simultaneously, e.g., be aware of both the hands resting on the upper parts of the thigh and the soles of the feet in contact with the ground, at the same time. Pay attention to an auditory sound, e.g. birdsong outside the window, or random sounds from within the room or from the corridor outside – while maintaining a sense of the observing self by staying grounded within the totality of the whole Self. Be aware of “what does not feel right” within the body, where it hurts or where there is tension. Think of the area of tension and stay “in grounded presence” at the same time by being strongly aware of the soles of the feet contacting the floor in a neutral observing manner. In this research, we are investigating “mindfulness” (to use a Buddhist term) and how our awareness can be directed to function in different ways, at different times. I can be aware of just one thing, e.g., I can be aware of just my feet contacting the ground as I sit here typing, or I can be aware of just the background sound of the washing machine spinning and I can easily get sucked into it. My reactions start to kick in, like the machine distracts me, and it starts to annoy me, and I start to tighten in my upper chest and stomach muscles. Or, I can choose to be aware of myself being aware, and something different happens, I become non-resistant and my consciousness expands to include a sense of both my whole self as an embodied being and the sound of the machine in the background. I feel completely different and something has shifted in my attitude towards the situation and in my brain function. Funnily enough the machine then stops spinning as well. When we did this listening to the sound experiment something very interesting happened on the EEG scans. The brain shifted from beta wave activity in (1) into alpha wave activity in (3) which is a much calmer rhythm of brain activity associated with creativity, openness, relaxation and meditation. The awareness now encompasses two reference points simultaneously and the interconnecting space in between comes alive. There was a marked shift in the type of brain wave activity from beta waves in experiment (1) Baseline (at rest), compared to all the other 4 experiments, where the brain went into alpha and even theta wave activity (the super-calm relaxed state) during the WBF experiment at the end. You can replicate experiment (2) for yourself right now, if you want to. Sit upright on a chair with the palms of your hands resting on the top of your thighs, or flat on the table top in front of you. Be aware of your hands resting there in a relaxed manner and at the same time be aware of the soles of your feet contacting the floor. Hold both points in awareness “in equal positive regard” (in a neutral detached way) and also be aware of the interconnecting space in between for a couple of minutes and see what happens. If the attention wanders, keep bringing it back. Gradually, after a period of time, what seems to happen for most people is that the breathing starts to calm down, the body starts to feel grounded and more relaxed but more supported at the same time. The space in between the two points starts to come alive. There is an inward drawing and concentration of energy and awareness in the brain and the spinal column and a rising and expansion of consciousness as the brain goes into alpha wave brain rhythms. There naturally arises a feeling of calmness, relaxation and openness. This could be the start of meditation or it could be a very productive time for going into a Focusing session with yourself. The general principle is that there are two points of reference and the interconnecting space in between. I believe that exactly the same thing is also happening during regular Focusing, because there is a detached, observing consciousness (self) and the part that does not feel right. When the focuser can say “something in me is calling for attention, it hurts, it feels like......” and yet there is also the observing self that is bigger than that, the observing self can contain the part that does not feel right in detached awareness and not get sucked in by it. It is the interplay between these two parts and the interconnected space in between, which actually allows the brain to go into alpha rhythms and allows the shift to take place. If the Focuser cannot do this for themselves, then they need help and one of the most vital interventions that the listener (or Focusing-oriented therapist) can make is to ask the Focuser to change their language to say “something in me is feeling....” and that then stops all of you from getting completely sucked into the emotional memory of the pain/trauma and helps to facilitate a shift. I have appreciated this type of intervention in the work of Ann Weiser Cornell and Joan Klagsbrun at the Focusing Institute Summer School and I have always noticed how effective it is in facilitating a shift. The same thing happens in WBF, but in a slightly different way. A really crucial intervention that is often needed is when the listener/FOT asks the Wholebody Focuser to be aware of both (a) the sense of a part of the body that carries tension and does not feel right (and the exploration of meaning associated with that) and (b) also the sense of strength and support that you get from feeling the soles of the feet being in contact with the floor and being in grounded presence. The request is to see if you can “hold both in equal positive regard” (Kevin McEvenue, Dancing the Path of the Mystic). After the listener had reflected back these words, Client X contacted even more of the felt sense: “I’m not expressing ... not putting energy out into the world ... not connecting with the world ... not feeling supported.” So a really crucial intervention at this stage was when Client X was asked to connect with the support of the ground through the soles of the feet and “to hold both with equal positive regard”. Having done so in awareness for a period of time Client X began to experience something else happening. That something else that Client X experienced during the course of the WBF session was revealed in the qEEG brain scans. What had happened is that during the course of the WBF session the brain went from normal Beta waves right into Alpha and even stronger Theta wave patterns. As the clinical psychologist Dr Christine Kraus reported: “Overall, it appears that the therapy that was addressed within the various sessions increased visual and sensory awareness to one’s self and increased the relaxed focused state. It appears that session 5 (the WBF session) also enhanced the super learning or creative spiritual thought process as Theta was increased as well” (Dr Kraus, Amen Clinic, Newport Beach). You would expect Alpha waves in a pleasantly relaxed, creative state, and during regular meditation periods, but Theta waves are normally only present during periods of very deep meditation by highly experienced meditators, or during deep hypnosis. During Theta (4 Hz – 7 Hz) there is deep calmness, creativity, the recovery of suppressed long-term memory, and the facilitating of repressed emotions. There can also be a vibrant, living awareness of our ever- present spiritual connection with the whole of the Universe, or God, which is often hidden by the speed and stress of modern life. At this stage of the WBF session, Client X reported experiencing feelings of “joy, elation, ecstasy, feeling connected to something bigger that myself, a sense of unity with the whole of creation.” So on the one side we have the trauma, the anxiety and depression – which is clearly indicated in the brain surface/brain interior SPEC scans and in the words, imagery, and body sensations of the WBF session (also in the initial reported attachment history of the client). On the other side we have a very clear indication of a sense of joy and a sense of connection. Something else has come into the client’s field of consciousness and is offsetting the experience of trauma. What is crucial in WBF is the intervention to ask the client to “hold both in equal positive regard,” because there are now two points of reference that can be held in the field of neutral awareness and a whole new inter-connected energy comes out of that, something happens between them. This is in line with the expectations of Field Theory which is actually “a region of mutual influence between two or more points in space, often via a force like gravity, electro- magnetism or a conscious human being.” (McEvenue & Whalen). There is a blocked energy in the trauma that can now free up by connecting with this other place. There is a participation, an engagement of both, not a getting rid of something. The link between the joy and the trauma is what gets the client moving. And in this feeling of awakened new energy the self seems to want to experience itself more fully and explore its full potential. The suppressed energy within the trauma can now turn positive, when seen from a bigger perspective all the pain and suffering of the defended position and all the adaptations and desperate survival techniques are seen for what they are – just a way of defending a vulnerability that was not strong enough to stand unaided. 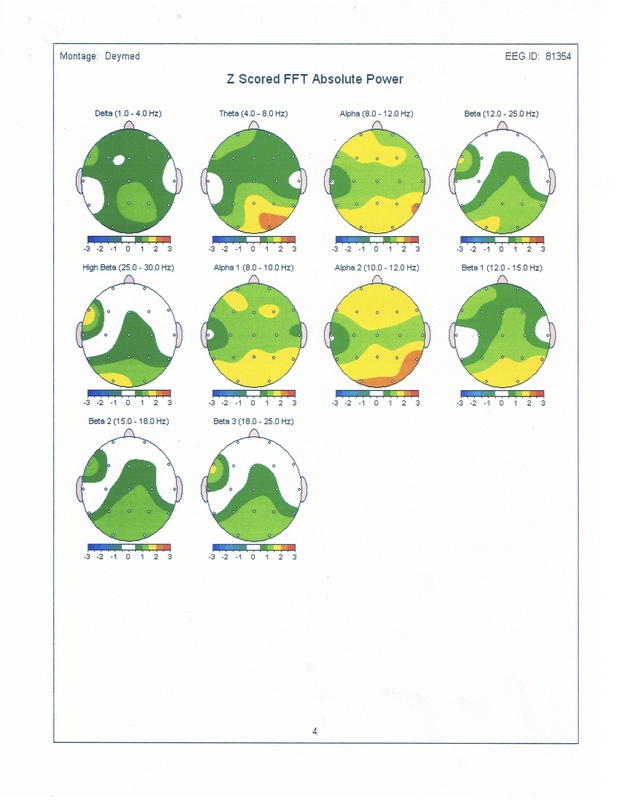 Another interesting result of the EEG scans was the left hemisphere/ right hemisphere story that emerges. This is in line with the writing of Peter Afford, in his very interesting article “Focusing in the Age of Neuroscience”. Focusing first starts to operate in the right hemisphere, as the right brain goes into Alpha and Beta wave patterns. It is the murky, unclear felt sense of the “whole of the situation” as “something that is not quite right” struggles to emerge into consciousness from the holistic and symbolic perceptions of the right hemisphere during the Focusing session. It is the right side of the brain that first goes into Alpha and Theta wave patterns and opens up to a sense of connection with a greater whole and a sense of knowing – even when this cannot be expressed cognitively yet. It is that sense of “I know something but I’m not sure what it is and I cannot express it fully yet.” Then the Alpha and Theta brain wave pattern moves over into the left side of the brain to influence the cognitive functioning of the brain as the Focuser gropes to find the right word or phrase that will fit the image or the feeling. This is “finding a handle” in Focusing terms, but even at this stage there is still a slight right brain preponderance of Alpha and Theta wave patterns – which is exactly what the EEG results in this study have confirmed. 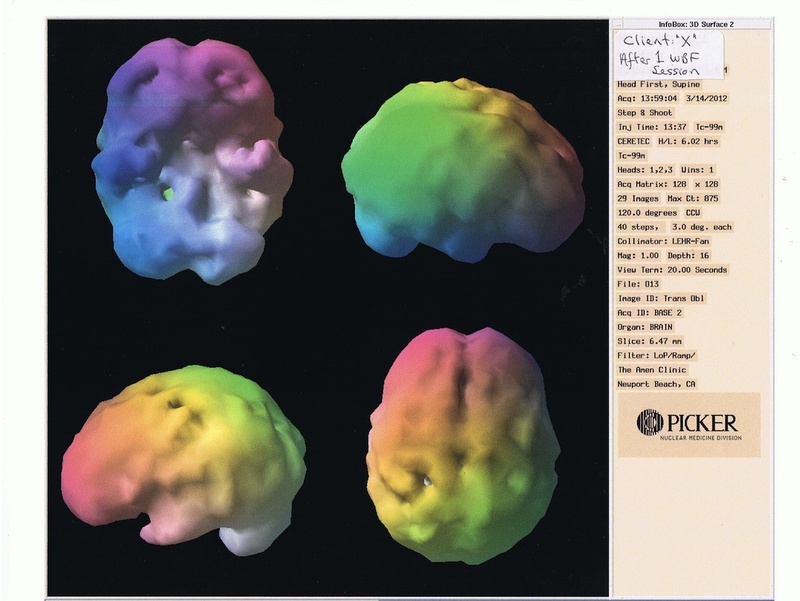 Not surprisingly, the 3D Active (interior) SPEC scan images, which look deep inside the brain to the more primitive, deep-seated emotional reaction patterns in the basal ganglia and the focal thalamic system show no change in the before/after scans and this reveals that the more fundamental, severe anxiety and depression issues were not dealt with in a single WBF session. This all points to the “elephant in the room syndrome,” an issue that is so big and so prevalent and that affects so much of the behavior of the client that it isn’t even talked about explicitly in the Focusing session. Barbara McGavin and Ann Weiser Cornell have developed a way of approaching this sort of issue in their “Treasure Maps of the Soul” methodology. The tentacles of this particular issue reach into many seemingly disconnected areas of life but at root is a feeling of dis-couragement and dis-empowerment. It is probably a big issue rooted in the attachment history of the client and the body, in all its wisdom, will need more time to resolve it. Obviously these are big issues and no one would seriously expect a single WBF session to change all of this; but on the flip side of the coin the amount of positive, forward moving life energy that is waiting to be released is also huge. So over the course of the next six months during ongoing weekly WBF sessions the plan is to work in a very focused way with Client X, within the therapeutic relationship, on these attachment issues, the memory of which are retained deep within the muscular tension patterns of the body and the subconscious mind. The test is to see if regular WBF can change these deep-seated patterns of anxiety and depression. 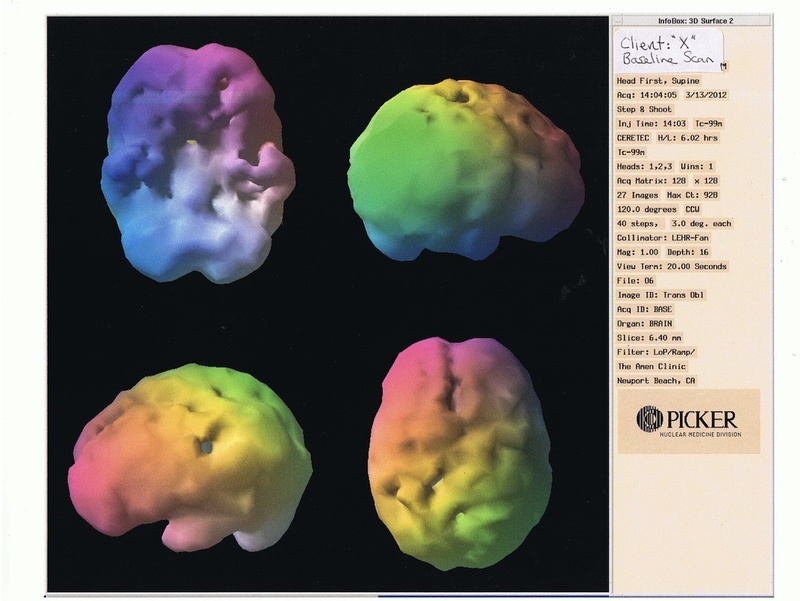 This we will see when we do the final follow-up brain SPEC scan at the Amen Clinic to see if any permanent changes in the 3D surface and active SPEC scans can be verified. Alex Maunder and Lucie Therrien invite you to “Read the whole study” on the website www.wholebodyfocusing.org to view all the images and read about the pilot study in full.